I first came across the term “Steampunk” earlier this year, and I had no idea what it was referred to. I was actually a little disappointed in myself that I might have missed some major cultural development. With the futuristic elements at first I thought it was based on some sort of “Blade Runner”-esque view of the future. You know, where there’s lots of punks, and… well… steam. I should have known that wasn’t what it was about, but it was a while before I figured out that it referred to the Victorian period. It was capturing an alternate history where adventuresome “punks” manage to corral steam-age technology into accomplishing all sorts of futuristic feats. Ultimately, it goes back to H.G. Wells or Jules Verne, who were able to envision fabulous technology in the future but based in the only technology they knew at the time. The first thing that struck me about this, was how often the signs of a cultural movement show up before the movement is really defined. Taking punk music for example, the Stooges or the New York Dolls were performing their music before anyone was calling it “punk.” In the case of steampunk, I immediately started thinking about works like “The League of Extraordinary Gentlemen” or “Neverwhere.” I also saw the origins of the style in goth style. I could even see how it developed looking at my stepdaughter’s progression from something vaguely goth to more and more focus on Victorian styles to the point where she bought a top hat and dressed as a sort of Mad Hatter for Halloween. 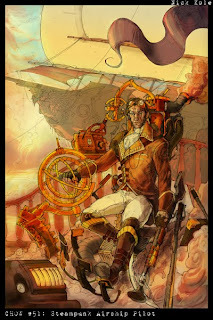 But the most remarkable thing about steampunk to me is that it even exists. If you think about other cultural movements in recent times, they all seem to be aimed towards the future– like hippies or new wave– or total nihilism– like punk. Either way they’re about significant change: trying to make society something different than what it is. I’m not sure if this is good, bad, or indifferent; but I do think it’s worth considering what it might mean about us and about what direction we want our world to go. Entry filed under: Uncategorized. Tags: culture.